I have divided this topic into questions and answers together with sections as to provide ease of reading and reference. 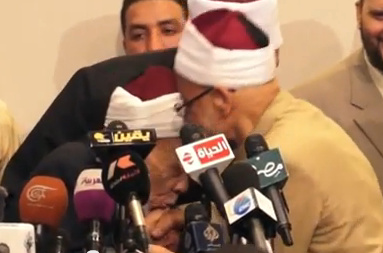 Question: Is kissing the hand of the Shaykh an innovation or are there grounds for it within the sacred law? Everything by default is considered permissible [mubah] and can only be rendered disliked [makru] or forbidden [haram] by the Law giver [Subhanahu wa ta’ala]. The correct phrasing in the Shafi`i School is that “The default status of things is indifference until the proof indicates prohibition” (al- aslu fil-ashya’i al-ibahatu hatta yadulla al-dalilu `ala al-tahrimi) reference [al-Suyuti, Ashbah (Cairo 1998 ed. 1:166)]. Man has no right in declaring things permissible [halal] or forbidden [haram] without first verifying what Allah [Subhanahu wa ta’ala] mentions in the Quran and what The Prophet [peace be upon him] mentioned in the Sunnah. If no evidence can be found in the hadith literature then one needs to verify what the companions of the Prophet [peace be upon him] said. 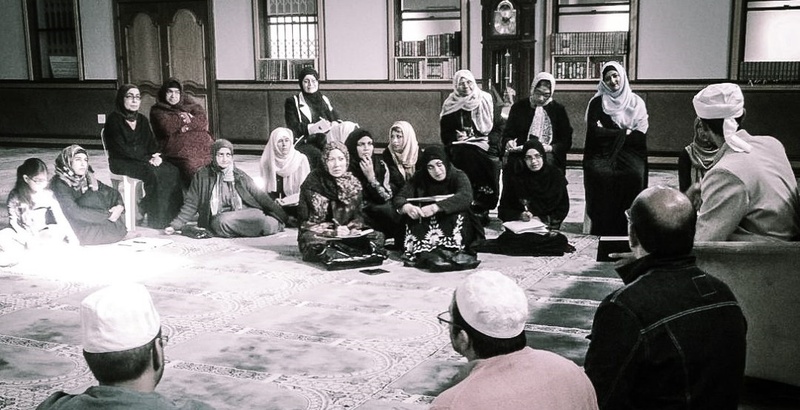 The Imams of the schools [madhaib] bravely, tirelessly and effortlessly sifted through the above mentioned primary sources and derived rulings which were firmly rooted in the Quran and Sunnah. If we take the Quran as the first source of Law then we need to find a text, unambiguous and clear, indicating that kissing the hand of another human being is forbidden. If we cannot find such evidence then we can move to the Sunnah of the Prophet [peace be upon him] and the suggestion would be to start with the works of Imam Bukhari. Imam Bukhari’s collection of ahadith [p. hadith] is considered the most authentic collection today after Imam Muslim’s collection. Some however consider Imam Muslim’s collection to be more authentic. Section: A look into what the hadith literature says regarding the kissing of the hand. 974. Anas [Allah be pleased with him] was asked, “Did you touch the Prophet [peace be upon him] with your hand?” He replied, “Yes,” so they kissed it. Reference: Narrated by Imam Abul Qasim al-Qushayri in the Risala and al-Khatib in al-Faqih wa al-mutafaqqih (2:99), Bayhaqi in al-Madkhal (p. 137), and Ibn Sa`d in his Tabaqat (2:360) from Abu Nu`aym with a sound (sahih) chain according to Ibn Hajar in al-Isaba (1:561 “Zayd ibn Thabit”). Also by Tabarani and Ibn al-Muqri’ in his Rukhsa (p. 95 #30), Tabari in his Tarikh (11:57, al-Fath), and Ibn `Asakir in his Tarikh in the biography of Zayd. The number of narrations mentioning the companions kissing the hands and even the feet of the prophet [peace be upon him] are indeed great in number. 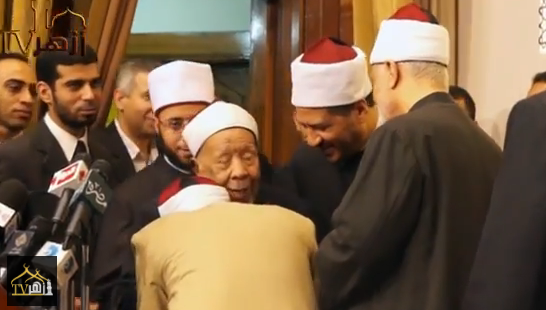 Section: Imitating the scholars of the Azhar, including the Grand Mufti, ‘Ali Jumma. 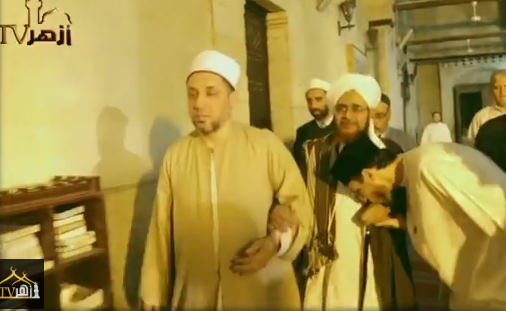 Below is a video clip of the foremost orthodox Sunni scholars from Azhar University in Cairo, including the current Grand Mufti, ‘Ali Juma, kissing the hand of Shaykh Muawwad Iwad Ibrahim’s hand. Sayyid Ahmad ibn Zayni Dahlan was of the eminent scholars of his time and the Shafi’i mufti of Makkah during the second half of the 13th century. He was born in 1231AH. He lived when the first printing press was established in Makkah, which resulted in a number of his works being printed. He wrote chiefly on fiqh and history. Aside from his writings, his major contribution to the madhhab came in the form of his numerous students, including Sayyid `Alawi ibn Ahmad al-Saqqaf, Sayyid Abu Bakr Shatta, Shaykh `Umar Ba Junayd, and Sayyid Husayn ibn Muhammad al-Hibshi. Below is the Sayyids chain of transmission for [kissing of the hand], which is well known amongst the scholars as the musalsal taqbil al-yad [the chain link of kissing the hand]. I kissed the hand of Ahmad bin Muhammad al-Damanhuji, who kissed the hand of Abdurahman bin Hasan al-Jabarti, who kissed the hand of al-Sayyid Khalil bin ‘Ali al-Muradi al-Dimashqi, who kissed the hand of Shakir bin Mustafa al-Halabi, who kissed the hand of Sayyid Muhammad bin ‘Abdu Rasul al-Barzanji, who kissed the hand of Safi al-din Ahmad bin Muhammad al-Qashashi in Madina al-Munawwara, who kissed the hand of ‘Ali bin ‘Abdul Quddus al-Shinnawi, who kissed the hand of ‘Abdul Wahhab bin Ahmad al-Sha’rani, , who kissed the hand of Moulana Zakariyya bin Muhammad al-Ansari, , who kissed the hand of Hafidh Ahmad bin ‘Ali bin Hajar al-Asqalani, , who kissed the hand of al-Salah Muhammad bin Ibrahim bin abi ‘Umar al-Maqdisi, , who kissed the hand of al-Shams Muhammad bin Ahmad bin ‘Uthman al-Dhahbi, , who kissed the hand of Abu al-Hasan ‘Ali bin ‘Abdul Ghani al-Mu’addal, , who kissed the hand of ‘Abdul Latif bin Yusuf, who kissed the hand of ‘Abdul Mubarak bin Muhammad al-Badhrani, , who kissed the hand of Abu Ja’far Ahmad bin al-Husayn al-Sarraj al-Qari al-Baghdadi, who kissed the hand of Abu Ja’far Muhammad bin Ahmad ibn Muslimah, who kissed the hand of Abu ‘Abdullah Muhammad bin ‘Imran al-Marzabani, who kissed the hand of Sa’d bin Ahmad al-Katib, who kissed the hand of Ahmad bin Khayshuma, who kissed the hand of Abu Sa’id Muhammad bin Ziyad al-‘A’rabi, who kissed the hand of Ahmad bin Musa bin Is-haq al-Sa’di al-Hajjar, who kissed the hand of Abu Hafs ‘Umar bin Ibrahim al-Kurdi, who kissed the hand of Mandal, who kissed the hand of Sa’id ibn Marzaban, who kissed the hand of Miqsam, who kissed the hand of Husayn bin ‘Ali bin Abi Talib, who kissed the hand of ‘Ali bin Abi Talib, who said, “I heard the Prophet [peace be upon him] say, “The Muslim kissing the hand of his brother is musafaha [shaking the hand]“. Section: The four orthodox Sunni schools of thought on the kissing of the hand. It has been related from Imam Malik [may Allah be pleased with him] that it is disliked, but the later scholars of the Maliki school are in agreement with the majority that it is permissible. They interpreted the position of it being disliked that was related from Imam Malik [may Allah be pleased with him] as referring to a situation in which it leads to arrogance. Imam al-Abhuri [may Allah be pleased with him] said, “The dislike of Malik is if it is out of aggrandizement and arrogance. Imam an-Nafrawi said, that an example of it is the kissing of the Bedouin who asked the Prophet [peace be upon him] for a sign.” The Bedouin asked the Prophet [peace be upon him] “Show me a sign.” So the Prophet [peace be upon him] said, “Go to that tree and tell it, ‘The Prophet calls you.’ The tree moved right and left and came towards the Prophet [peace be upon him] saying, “Peace be upon you, Messenger of Allah.” The Prophet [peace be upon him] told the Bedouin, “Tell it to return,” and it returned as it had been. The Bedouin kissed the Prophet’s [peace be upon him] hands and feet and became a Muslim. And there are other similar narrations besides. These are the opinions of the Umma. The difference of opinion is a slight one with the majority of orthodox sunni schools declaring the permissibility of kissing the hand. We kiss the hand of hand of the hand, of the hand, of the hand,… which touched the hand of the best of creation [afdal al-makhluqat] [peace be upon him].